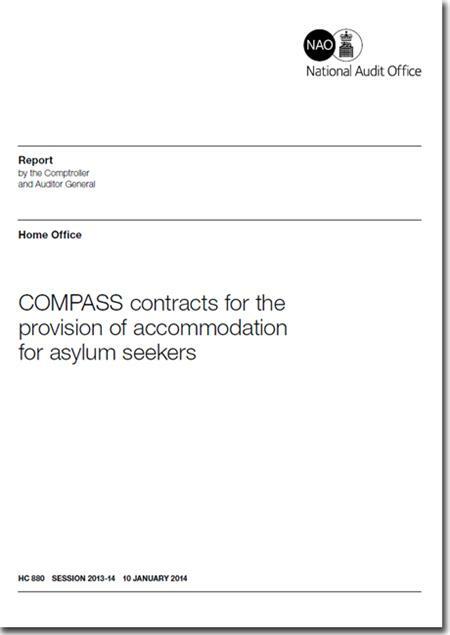 The audit office report 'COMPASS Contract For The Provision Of Accommodation For Asylum Seekers: Home Office (HC 880)' examines the costs to the Home Office of providing accommodation for asylum seekers, which for the period 2011-12 was £150 million; in March 2012 the Home Office signed six new contracts called COMPASS (Commercial and Operating Managers Procuring Asylum Support) with three providers (G4S, Serco and Clearel) aiming to save around £140 million over seven years. In 2012-13, COMPASS achieved a saving of £8 million. Clearel was the only contractor to meet its original deadline. G4S and Serco struggled throughout the transition period to establish a robust and reliable supply chain of housing using existing housing providers, and sourcing new houses. In the North West, North East, Midlands and East of England the transition to the new contracts took longer than originally planned. Of the 20,000 asylum seekers housed by the Home Office at the time of transition to the new contracts, around 90% were able to stay in their existing accommodation. Some of those who were asked to move received mixed messages, and communications were not routinely translated - risking gaps in understanding among those affected. Commercial negotiations are still underway over whether the contracts need to change, what additional costs have been incurred by the Home Office and what rebates to the Home Office from the providers should be applied for poor performance. The providers believe the information supplied to them by the Home Office during procurement was inadequate in some areas and has resulted in some of the difficulties now faced in running the service.